For this article we’ve looked into the companies developing the latest solar-powered drone or unmanned aerial vehicles (UAV’s). Earlier this year one of our team members was involved in the development of a remotely controlled solar powered drone. 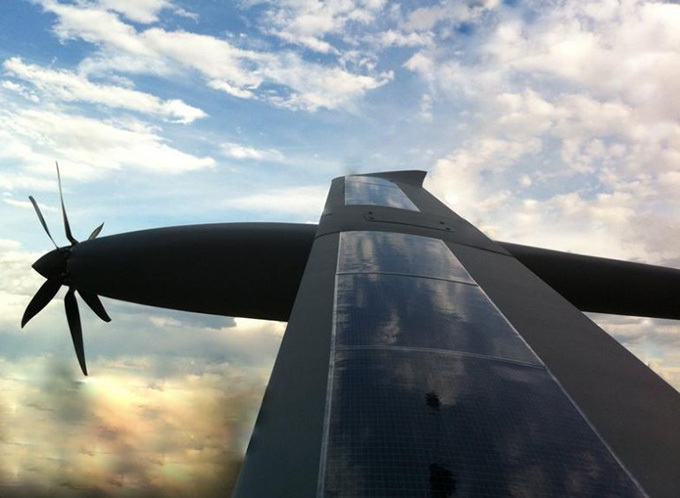 By encapsulating the solar cells directly on the wings, the weight was reduced to a minimum while maintaining the right aerodynamics. 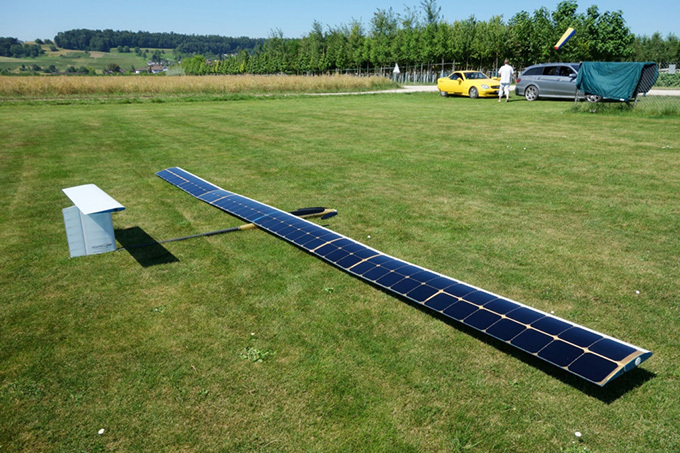 This exercise proved that the flight range of electric planes and UAV’s can easily be extended with the use of high efficiency solar cells on the wings. While working on this RC solar powered UAV project, of course the question of “What are the leading companies that are developing solar powered drone technology?” came up.. This article is the overview! Solar-powered aviation has seen a sharp rise in R&D expenditure for the past 2 years, with especially lots of progress in the domain of solar powered drones or UAVs. Until 2013, drone or UAV technology was mainly the domain of the defense industry. However the past 2 years we’ve seen small private companies, large tech- and aviation companies jump into this new market. According to ABI Research, the drone industry is going to be worth a whopping $8.4 billion by 2019. It’s not just the sales of the hardware, it’s mainly the applications and services where most growth is expected. And the most exciting part: solar energy is playing an increasingly important role in the development of UAV technology. Right now there are over a dozen of tech and aviation companies working intensely on the development of solar powered drones. Airbus, with it’s subsidiary Astrium, has been working on High Altitude Pseudo Satellites (HAPS) since 2008. In 2013 Astrium acquired the Zephyr solar powered UAV assets from British defense technology company QinetiQ, integrating the QinetiQ Zephyr staff into Airbus’ organization. Zephyr is a High Altitude Pseudo Satellite (HAPS) UAV running exclusively on solar power. Zephyr has evolved through the years with different models. Airbus is currently working on Zephyr 8. Since 2014 Airbus has continued to develop the Zephyr and break records. In September 2014 the Zephyr became the first ever UAV to perform a flight authorized by a civil authority. 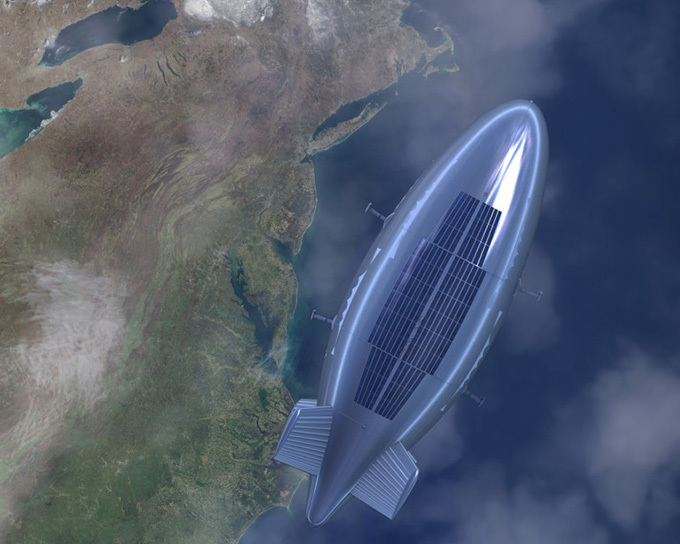 The company aims at full commercializing of the Zephyr as an alternative to satellites. The UAV has all the advantages of an aircraft and satellite combined: it can be re-used and has a wide coverage due to its flexibility in location. At the same time it’s capable of taking on similar tasks as satellites: it can fly at high altitudes, perform similar applications and is reliable. Airbus is targeting several applications with its Zephyr drone, including Full HD imaging, thermal imaging, the creation of temporary communications networks and emergency services support. Boeing’s dedication to solar power technologies dates back to 1973, which began after the oil embargo made it clear that fossil fuels can not be relied on and that alternative energy sources are needed. Back then it already researched large scale solar power producing satellities, interesting read about Boeing’s solar energy history here. The Phantom Works division is the advanced prototyping arm of the Defense and Security side of The Boeing Company. Its primary focus is developing advanced military products and technologies, many of them highly classified (Source: Wikipedia). Boeing SolarEagle (Vulture II) is a solar powered unmanned aerial vehicle (UAV). Unique about this drone is that it’s built to eventually remain airborne for over 5 years, and therefore is considered a High Altitude, Long Endurance (HALE) plane. US’ organization DARPA has injected USD 90 million in the project, with Boeing investing the rest. Google got into the business of solar-powered drones with the acquisition of Titan Aerospace, a high-altitude, long endurance (HALE) solar-powered UAV manufacturer in April 2014. Titan Aerospace developed drones called Solara 50 and Solara 60 capable of flying at a reported altitude of 20km for impressive periods of over 5 years. That period is an estimate, however at these altitudes there’s few that can disturb a plane to continue its steady path in the air. Drones capable of flying near the edge of the earth’s atmosphere, considered atmospheric satellite technology, would be more than suitable to offer cheap and widespread internet connectivity in remote areas, at costs well below those of commercial satellites. You may wonder if Google purchased Titan Aerospace because project Loon, with its large balloons that can travel the world in short periods of time, are perhaps considered less effective or reliable in providing internet connectivity in remote areas? Or perhaps the combination of perfectly controlled solar powered drones and Loon’s fast to deploy and rapid moving balloons can be combined into a hybrid system, creating the ultimate internet coverage network. 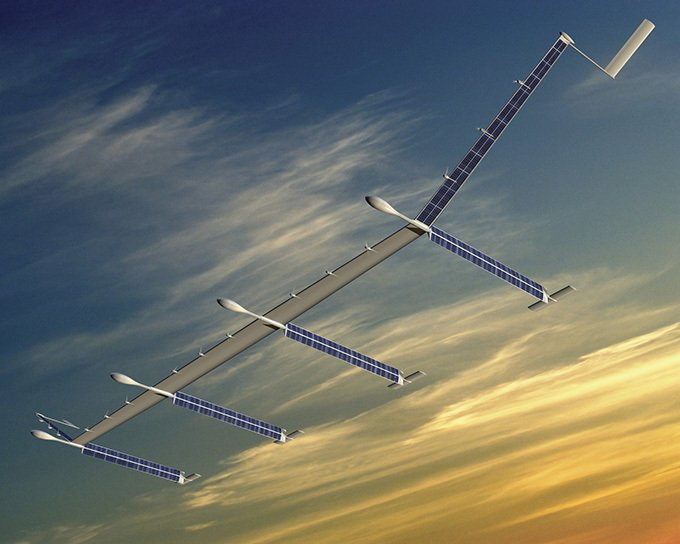 The latest solar powered drone project from Google is called the Skybender. Google recently hired a large warehouse from company Virgin Galactic have rented in the US state of New Mexico. From here it’s working on solar powered drone that can broadcast 5G internet all over the US. The Skybender drones are said to be experimenting with millimeter wave radio transmissions. These particular radio waves eventually will bring internet speeds of up to 40 times faster than we’re seeing with 4G LTE systems. It’s still quite a challenge to roll out the milimeter wave chencology, as they have a much shorter range compared to current mobule phone signals. The current signals that Google is experimenting with at the moment are known to have only 10% of the range of an average 4G signal. One solution Google is working on is to implement focused transmissions from a phased array. Currently Google is using different types of drones for the Skybender project, including the solar powered Google Titan and the Centaur. Once multiple drones are flying in an area, they will be replacing the traditional towers and receivers. Also they will be able to reach remote parts of the country. Eventually with project Skybender Google is aiming at providing 5G coverage worldwide. 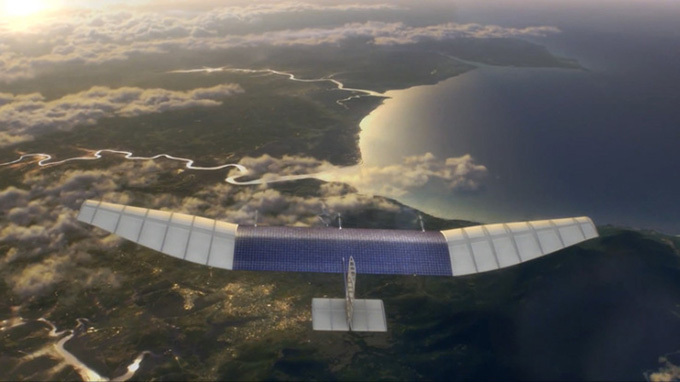 Facebook got involved with solar powered drone technology with the acquisition of UK based Ascenta in March 2014. Facebook’s Connectivity Lab is committed with internet.org to to build drones, satellites and lasers to deliver internet to everyone, regardless if you’re living in a world city or in a remote area of a developing country. Facebook and Google are going head to head when it comes to opportunity of offering high speed internet access to the billions of people who have never been connected to the world wide web before. Connectivity Labs believes that satellites will be most suitable for remote places with low population living over wide areas. Internet can be beamed down from multiple low orbit satellites, providing a continuous coverage. For the more densely populated areas such as towns, villages and suburb areas, Connectivity Labs will utilize high altitude solar powered drones (UAV’s). These PV powered drones will circle at 20,000 meters altitude, well above commercial airlines, away from disturbing weather, and will beam down high speed internet. Newly developed laser communication systems can beam data from the sky into communities. AeroVironment, the Pentagon’s top supplier of small drones, has an impressive portfolio of UAV’s. It was Paul MacCready, the founder of Aerovironment who created their first solar powered experimental airplane in 1979, the Gossamer Penguin. 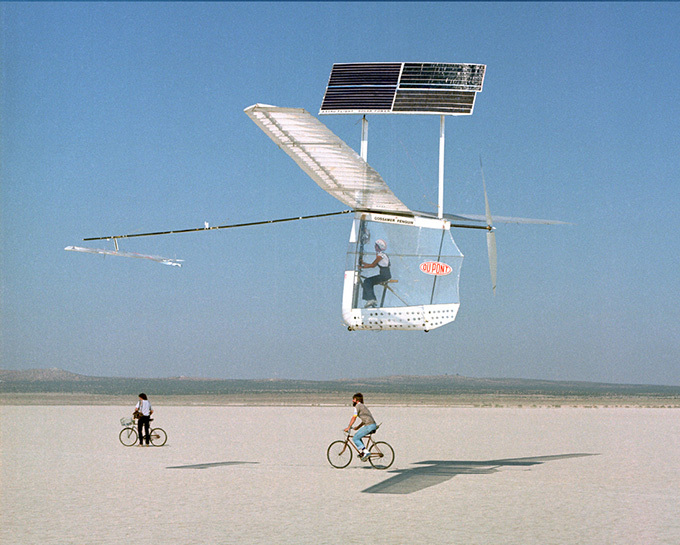 Gossamer Penguin – was a solar powered aircraft designed by Paul MacCready, who’s the founder of Aerovironment. The Gossamer Penguin was inspired by another plane, the Gossamer Albatross II. Some specs: weight without pilot of 68 lb (31 kg), 71 ft.(21.64 meter) wingspan and 541W of solar panels powered a Astro-40 electric motor. Funny detail is that the test pilot for the first flights was MacCready’s 13-year-old son, who weighed only 36kg (80lb). Solar Challenger – this solar powered plane is the improved version of the Gossamer Penguin. Interesting is that this solar powered plane didn’t carry any batteries and was capable of long distance flight. 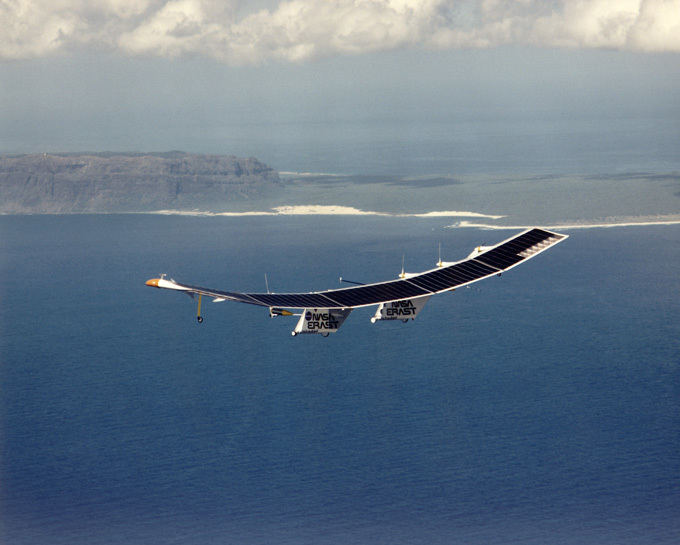 It flew 262 km (163 miles) from Paris to UK solely on solar power. 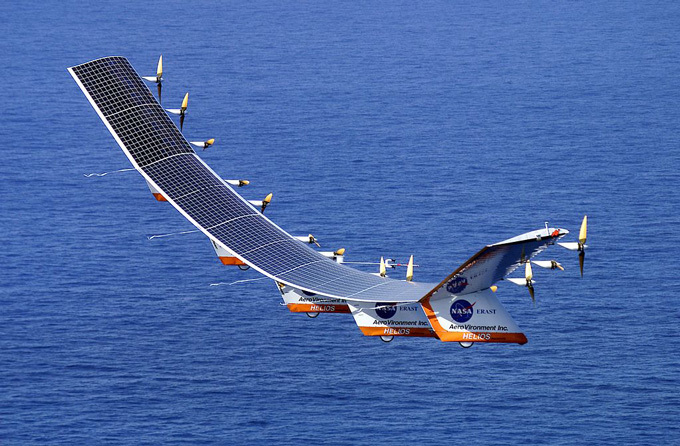 NASA Pathfinder and Pathfinder Plus are both UAV’s fully powered on solar energy. The drones were built by AeroVironment as part of NASA’s ERAST program. The main objective of building both solar powered UAV’s was to develop the technologies to allow long term, high altitude aircrafts to serve as “athmospheric satellites”. The Pathfinder Plus was later evolved into the NASA Centurion and Helios solar-powered UAV. The NASA Centurion UAV incorporated several improvements based on model Pathfinder Plus. The wingspan was extended to 63m (206 feet) and the solar powered UAV was designed to carry more payloads, of up to 272.2kg (600 pounds). Besides a larger wingspan, the plane increased the number of electric motors to 14 and enlarged the battery capacity. 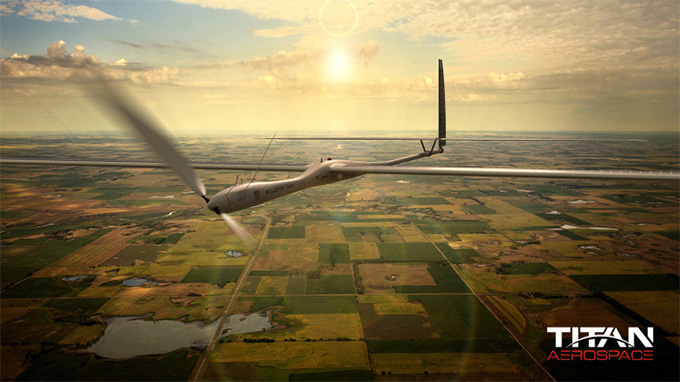 The fourth and final solar powered unmanned aerial vehicle developed by AeroVironment for NASA is the Helios. This solar powered drone evolved from the Pathfinder into the Helios, a long term, high altitude atmospheric satellite. The Helios was built with two objectives in mind: 1. Sustained flight at altitudes around 30,000m (100,000 feet) 2. Fly for at least 24hours, including 14 hours above 15,000m (50,000 feet). The HALE-D is a remotely-controlled solar-powered UAV that is designed by Lockheed Martin to float above the jet stream at 18,000 meters. HALE-D stands for High Altitude Long Endurance-Demonstrator. This unmanned lighter-than-air vehicle operates above the jet stream in a geostationary position and functions as a surveillance platform, telecommunications relay, or a weather observer. At the same time the HALE-D can be used in the defense industry as an ever-present intelligence and surveillance platform, offering rapid communications connectivity over the entire battle space. Bye Engineering is a subsidiary of Bye Aerospace and is a consultancy business with experience in alternative energy propulsion systems for general aviation aircrafts. Bye Engineering initially caught our attention when it teamed up with Global Near Space Services (GNSS) several years ago to develop a solar powered electric UAV. The UAV project, called Starlight, is a combination of high altitude, long endurance and efficient solar electric propulsion. The objective of the project was to use the solar powered UAV to obtain “satellite-like telecommunications and high altitude surveillance capabilities for a fraction of the cost of space-based systems”. Bye Engineering continued to develop innovative solar powered drones. Bye Aerospace assists Silent Falcon UAS Technologies with the design, research and engineering support of the Silent Falcon UAV. 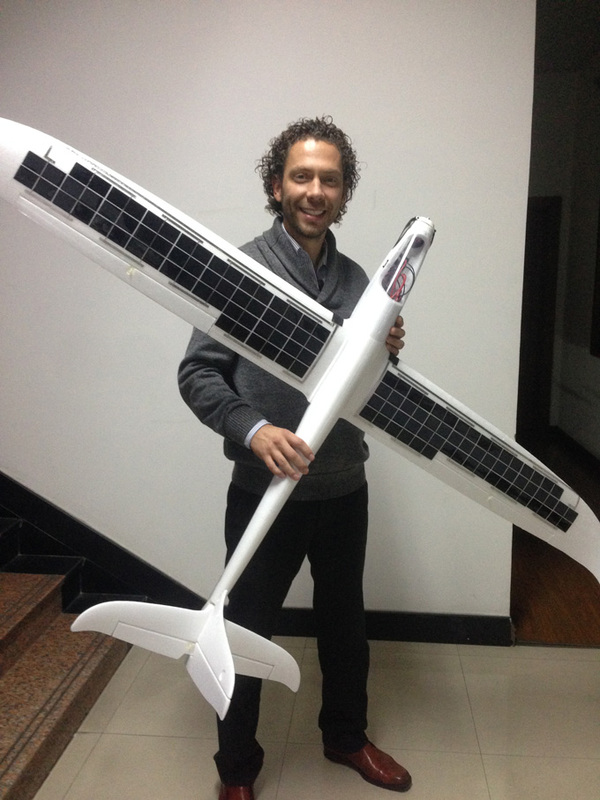 The Silent Falcon is a small, solar powered UAV with battery storage. The drone is powered with thin film solar PV panels and carries a 6 blade propulsion system. Potential applications include “homeland security, and military visual and thermal tactical reconnaissance. Potential civil applications include high security facility surveillance, pipeline and power line inspection, aerial law enforcement, forest fire detection, weather monitoring and aerial photography”. Atlantik Solar is headed by ETH Zurich’s Autonomous Systems Lab. The company has developed an autonomous, solar powered drone (UAV) with a wingspan of 5.6 meters that can fly up to 10 days continuously. “The first-ever crossing of the Atlantic Ocean using a solar powered Unmanned Aerial Vehicle (UAV)”. According to their project brochure Atlantik Solar is attempting to “cross the Atlantic Ocean with a ‘swarm’ of 4 UAV’s by the end of June 2015, crossing 5000km of flight distance during 7 days of harsh Atlantic environment with potentially strong winds and thunderstorms”. As this deadline has already been passed, we expect the team has slightly postponed its efforts which is common for such projects, as often ideal weather circumstances are required. Thanks for the great overview guys. These are spectacular developments and it seems that we've just reached the point where solar cells have increased efficiency levels to keep drones in the air continuously. Also interesting to see that it's not exclusively governments (NASA etc.) who are interested in solar powered drones, but also the private companies. I'll be closely watching developments for the years to come. What do you mean by "Movies coverage" Jonathan ? Perhaps AeroZone could help you for. Pls contact us through email...! What do you mean with "Movies coverage", Jonathan ? Perhaps we could help you to. Please contact us through email! Tx ! What's up to every one, it's truly a good for me to pay a quick visit this website, it contains helpful Information.